A gray whale that offered students a rare educational opportunity when it wandered into the Klamath River for nearly eight weeks this summer died this month after beaching itself on a sandbar. Photo courtesy of Allison Fuller. 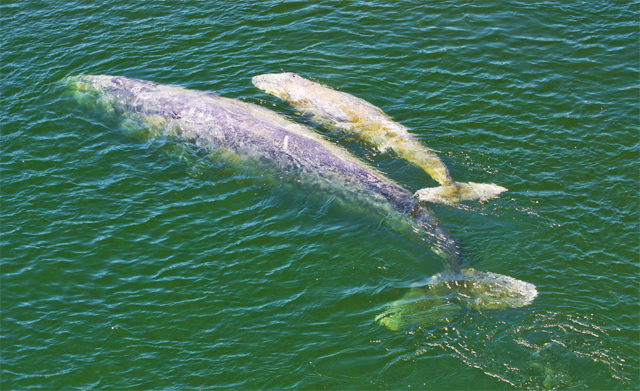 The 45-foot gray whale and its calf wandered into the Klamath River in late June. Scientists still aren’t sure what caused the mother to stay in fresh water so long. Scientists still aren’t sure why the 45-foot whale and its calf strayed into fresh water or what caused the mother’s death. But the occurrence offered students in Humboldt State’s Marine Mammal Education and Research Program and lucky passersby a unique opportunity to view the majestic creatures up-close. As is typically the case, scientists with the National Oceanic and Atmospheric Administration immediately called Humboldt State Zoology Professor Dawn Goley, who directs the Marine Mammal Education and Research Program (MMERP) at HSU. Over the course of several weeks, Goley and her students worked closely with NOAA, the National Marine Fisheries Service and the Yurok Tribe, which owns part of the river, to study the mammals and lure them back to salt water. At first, scientists were concerned that the calf, which appeared between 5 and 8 months old, was growing thin. But after three weeks, it left the river and was spotted swimming at the mouth of the ocean. After that, scientists teamed with agencies along the coast to encourage the mother to return to sea by following her in boats and clanking on pipes underwater. They hoped that the noise would act as enough of an irritant that the whale would move downstream. When that tactic didn’t work they played killer whale feeding calls into the river to try to evoke a flight response. Goley and her students continuously monitored the mother’s condition, taking photographs of her skin from the riverbank and listening to her calls underwater. Scientists were worried that prolonged exposure to fresh water and algae would damage her skin or that fishing boats would leave her agitated. Since water levels in the river drop during the summer, there was also concern she would become stranded. Scientists still aren’t sure what caused the mother’s death but are hoping that tissue samples taken before her burial will point them in the right direction. Photo courtesy of Dawn Goley. After the calf left its mother in late July, HSU students worked around the clock with scientists and members of the Yurok Tribe to try to coax the mother back to salt water. Gray whales are generally difficult to study in the wild because of their size – they can reach up 50 feet in length and weigh 36 tons – and because they migrate vast distances between their summer feeding grounds in the Arctic Ocean and their winter breeding grounds in Baja California. A small number of whales forego their full northern migration and feed along the coasts of the Pacific Northwest. Goley and her students have been studying whales that feed in the waters of Humboldt and Del Norte County for 15 years. But never in a river and never up-close. Open to undergraduate and graduate students, MMERP emphasizes field research, which means that students conduct long-term studies of marine mammals on the North Coast. Current projects include the tagging and tracking of harbor seals, surveying offshore rocks for Steller sea lions and surveying offshore and near shore waters for gray whales. 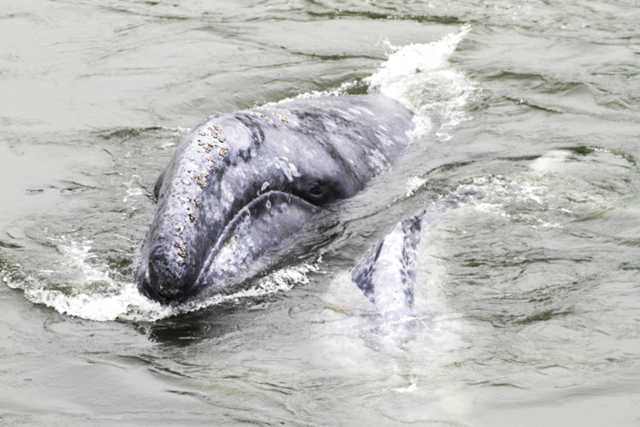 The last time a gray whale drifted into the Klamath for an extended period of time was in 1989. The whale fed in the river for several months before returning to the ocean on its own. In 2007, a pair of humpback whales attracted media attention when they wandered into the Sacramento River for two weeks before returning to sea.